It is not surprising to see books being released at the centenary of the 1918 influenza pandemic, arguably the greatest infectious disease threat the human race has ever encountered. I have devoured many books on this event, covering many different facets of what was a global catastrophic biological event like no other in which up to 100 million people perished and cascading effects impacted every aspect of human civilization. A new book focused on this topic was recently released and, unlike many other books I have read on this topic, was decidedly mixed and at times veered towards a conspiratorial tone. Books on infectious diseases are not immune from conspiratorial speculation but I was surprised it was present in one authored by an NIH physician. I found his discussion of the cascading impact of flu on the life insurance and pension industries particularly illuminated as it illustrated how economically important pandemics and severe influenza seasons can be (good for the pension industry bad for life insurance companies). Brown also explores the differences in how flu is conceptualized in different countries. In the US, there is an aggressive approach to influenza with universal vaccination as a goal and a stress on the complications of flu while in the UK a decidedly different approach is taken. In the UK, cost-effectiveness analysis (necessitated by their socialized, single-payer healthcare system) has found that the optimal targets for vaccination are children, the elderly, and those at risk for complications — the cost-effectiveness analysis is restricted to direct healthcare costs and does not account for absenteeism, lost income, and other costs. Interestingly, Brown also draws attention to the British “keep calm and carry on” attitude towards influenza which is thought of as just “a bit of a nuisance” with no mention of the severe complications such as death that are highlighted on the CDC website but not the NHS. Where I depart with Dr. Brown is on his position on flu antivirals and flu testing. With respect to flu testing, Dr. Brown, who works as an emergency medicine physician, is of the mind that it does not change treatment and the epidemiological value gained by specifically diagnosing cases does not justify the expense and the effort of reporting cases to public health authorities. Dr. Brown tends to treat patients with over-the-counter medications and the test does not change his treatment. However, multiple studies have shown that many flu patients are inappropriately prescribed antibacterial treatments and flu testing enhances antibiotic stewardship. Moreover, some hospitals collect flu data and use it to trigger specific actions from infection control and hospital administration when the season is in effect. This anathema to testing also likely derives from Dr. Brown’s position on antiviral therapy for influenza. There is a group of individuals, of which I believe Dr. Brown is a part, that doubt the efficacy of antiviral medications to make meaningful impacts on influenza. Drawing on the studies in healthy individuals with flu which revealed a modest decrement in symptoms, this group eschews the use of flu in high risk patients for whom the drug is considered life-saving based on observational data. Indeed, such a position of liberal use of antivirals in those at high risk for complications is embraced by the Infectious Disease Society of America (IDSA) guidelines. Dr. Brown also engages in speculation regarding the pandemic stockpiling of Tamiflu and the lobbying efforts of Roche, tying them to a suicide of a wealthy lobbyist who worked to raise awareness of the threat of avian influenza. 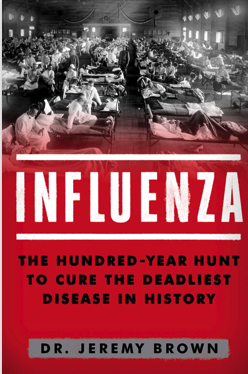 Overall, I recommend this book to those interested in influenza and the 1918 pandemic. The book is well-written and easily accessible however I do believe non-medical readers should approach the book with an active mind but could still have time grappling with the arguments made regarding antiviral therapy and diagnostic testing. For those with more knowledge of influenza, it is a good read that will challenge you to dissect arguments while learning more about flu.